Glamorous, isn’t it? 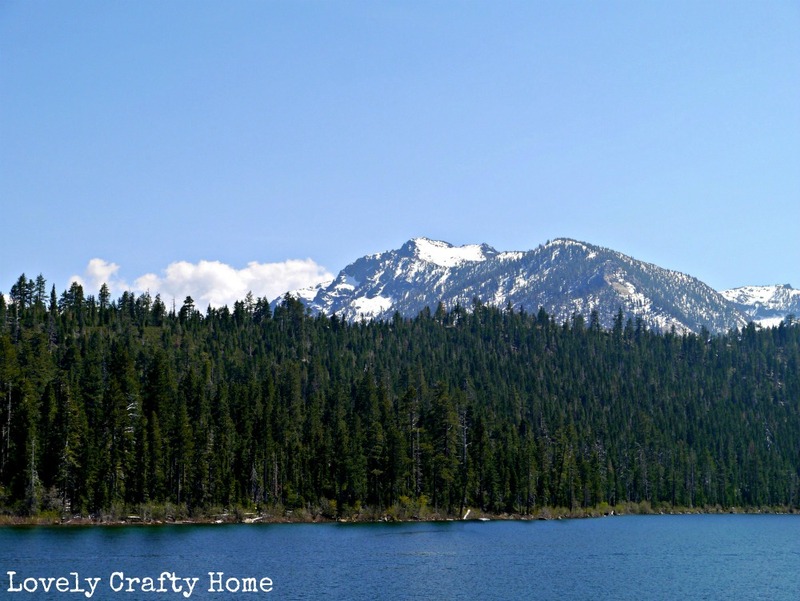 While I was visiting my mom in Reno, I couldn’t help but insist on tackling a DIY project in the house. They bought a beautiful house right on the meadow in a lovely neighborhood, but it had some features that were dated. My mom kept dropping the G word (that’s gut: the word that strikes fear in every DIYer’s heart), but I had other ideas. I think I won her over with the power of paint. 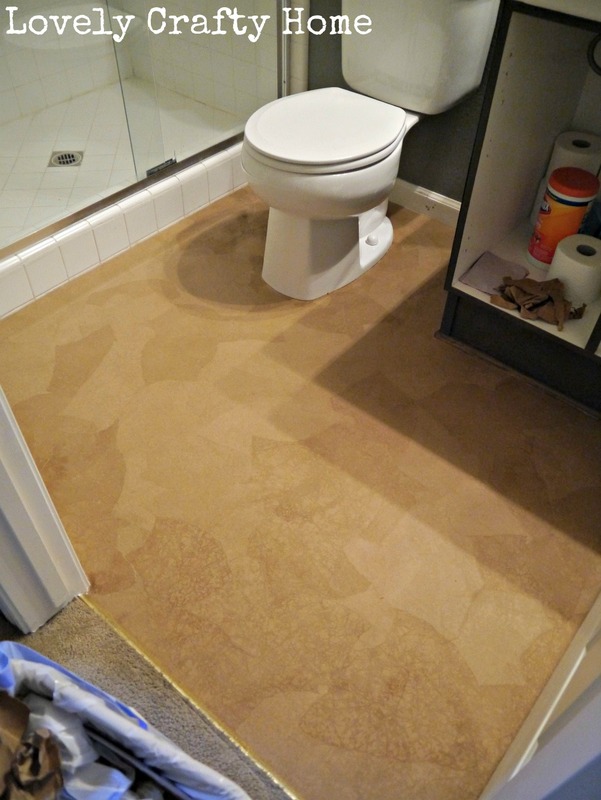 To start, we decided to do the brown paper floor treatment over the linoleum (WHAT? 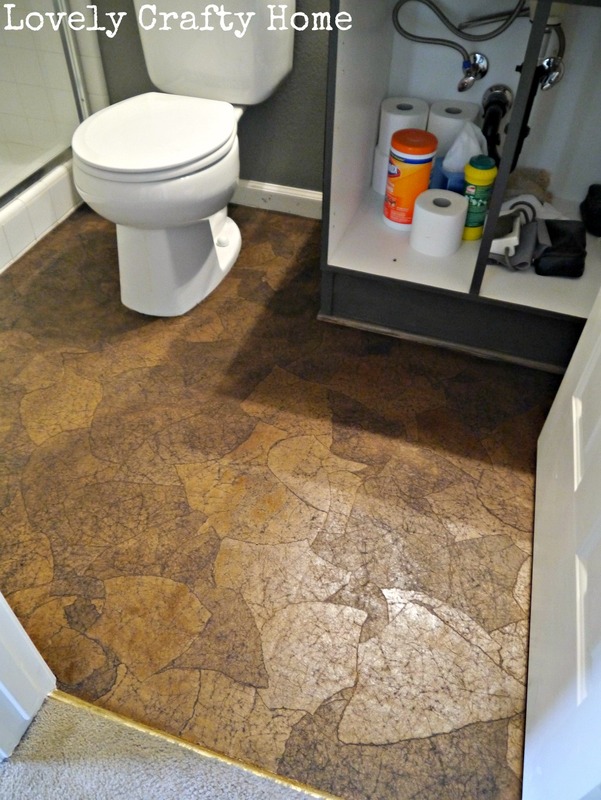 over linoleum?! Yes!). 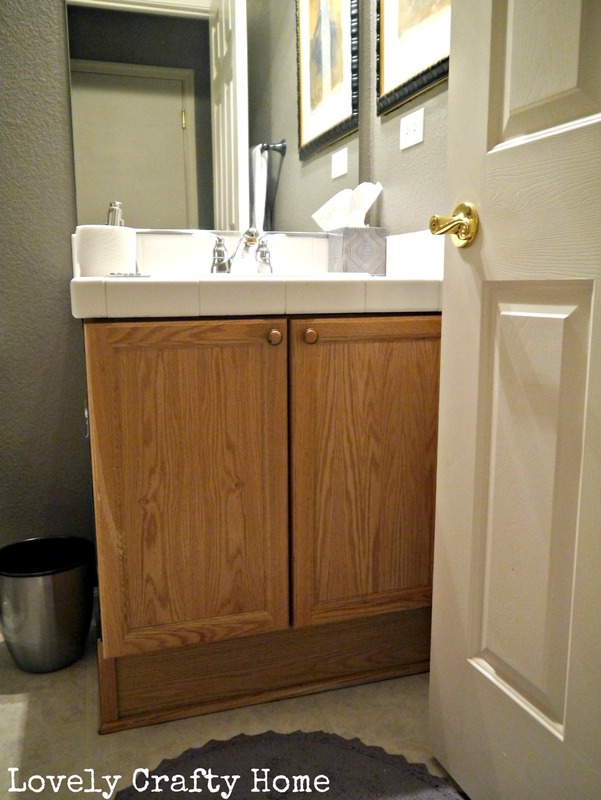 Then I swore to her that once I painted the vanity, she wouldn’t be bothered so much by the white tile countertops (which are all over the house, by the way). I suggested lightening the wall paint color. Less cave-like =good. Basically I wanted to reverse the light and dark colors in there, going dark on the floor and lighter on the walls. Framing out the mirror was also on the to do list. Surprisingly we were able to get all of it done in about 4 days and still managed to site see and goof off! I started with the floors and the vanity simultaneously, removing the doors and painting them in a separate room (SW7048 Urbane Bronze). Having never installed the paper floor on linoleum, I was unsure if it would 1) adhere and 2) show the grid lines of the faux-tile. But they were open to trying it, so we pressed on. I have to admit that things went MUCH faster when I had designated paper tear-ers. Between my mom, step dad, and me, we papered the bathroom in 2 hours using the 3:1 water to glue ratio. I thought we might have escaped any issues, but it turned out that as the stain went on the grid lines became more apparent. Can you spot them below? Once the poly started going on, it got more obvious. Also there were some issues with the paper curling around the edges of the room. I can’t say that it’s exactly because of the linoleum since I had some curling on my wood subfloor. But in my case, the paper was shoved under the baseboard (the carpet removal left a gap) so it didn’t matter as much. In this case, the paper was laid right against the baseboard. I applied some poly under the curling edges and used stacks of magazines on top of wax paper to hold the paper down in place. After 12 coats of poly and with the finished vanity, here’s where we stood. You see the yellow paint on the wall above? That’s the new wall color, which would happen after I left (you hear that, John?). 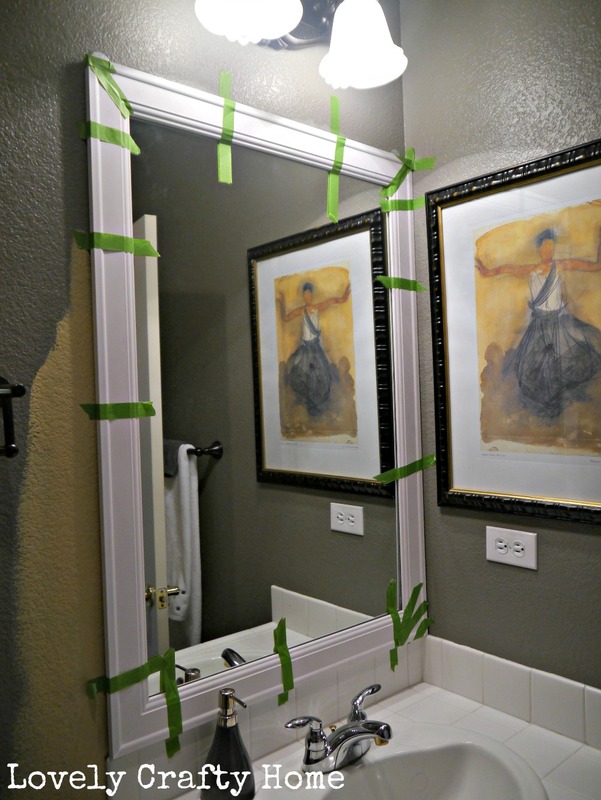 Then I shared my cheap-o miter box + foam moulding trick to frame out their contractor special mirror (check out this site for tips on framing a mirror held in place with plastic clips). 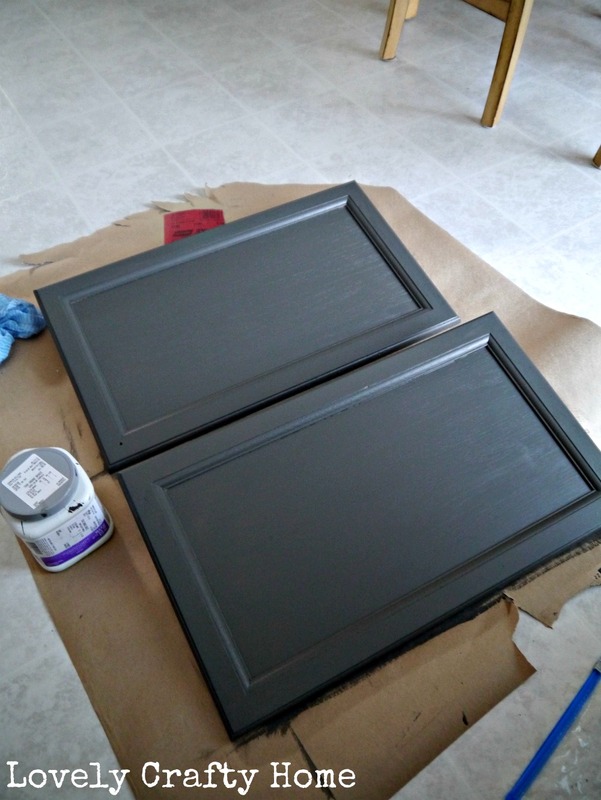 I think they are painting it the same color as the vanity. If you look closely, you can tell we cheated the mirror to the right with the molding to make it exactly the same width as the vanity. It’s much more balanced! Ultimately we opted to add quarter round (even though there was no gap) just to be sure the paper wouldn’t end up peeling. There’s another peek at the new wall color I slapped up from the tester pot. So, what do you think? Pretty good for about $150 in supplies (with leftover paper, stain, and poly for the kitchen floor). Looks Fabulous! I kind of like the ‘grout’ grooves in the floor. It looks like weathered wood! 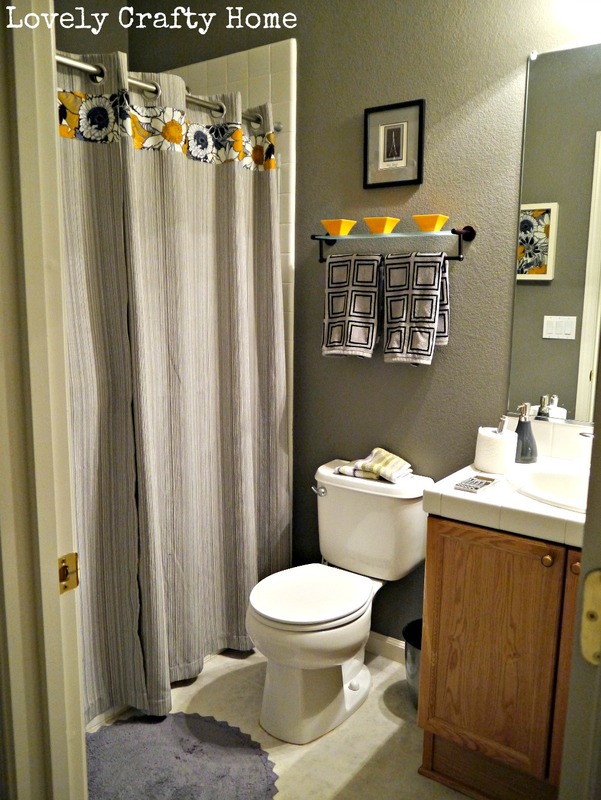 I also really like the yellow and lavender together…I think that might be my colors for my guest bath! Thanks. I also did this flooring over vinyl this past weekend. I love the pattern in my vinyl flooring, so was very pleased with the way it showed up after staining and poly. Next up is the bedroom. The bathroom make-over looks great! i don’t know if this will be answered, as this is an old post, but i want to do the vinyl sheeting in my kitchen and was wondering how it held up on the vinyl? thanks! 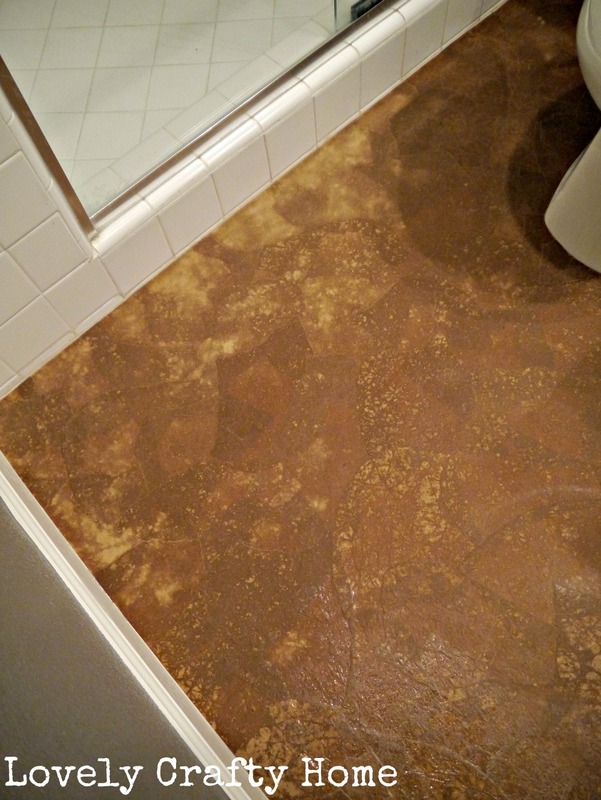 I did this technique on my floors back in Feb 2012 and I covered vinyl in my bathroom. I had the a similar issue with the edges. I went right to the floor trim. I did not put shoe molding down…but instead near the tub and in other problematic areas I just used caulk. (money was a factor too) I spent a total of $30 on the whole floor. It turned pretty great! The best part is, this is our only bathroom and so it gets heavy traffic–and lots of wet traffic from the pool …it has held up great. I think in the spring I’ll apply a couple more coats of poly just as an extra precaution (by then it will be about a year or so) and I am fully expecting it to last a long time! Your tutorial is a good one. 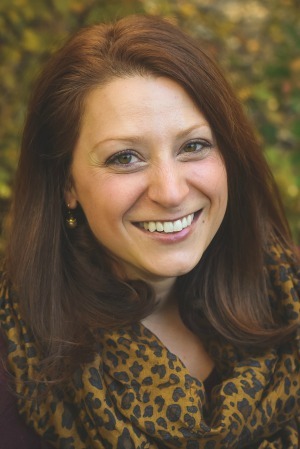 Thanks for posting this good Q &A ! Hi thank you for your information. I have read through all your directions a couple times now and don’t see if you prepped the vinl flooring first. 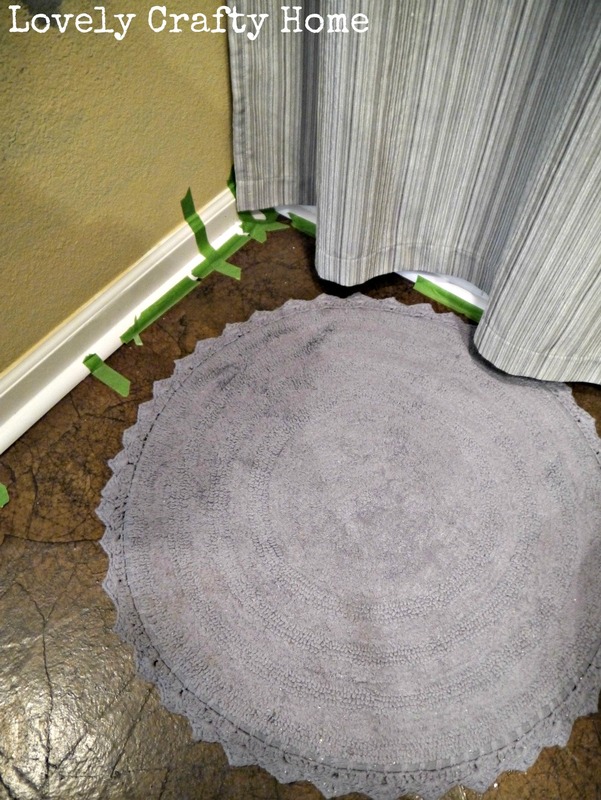 Did you sand the vinyl floor, or just go right over the vinyl? I was wondering if you heard of anyone doing this with white kraft paper. 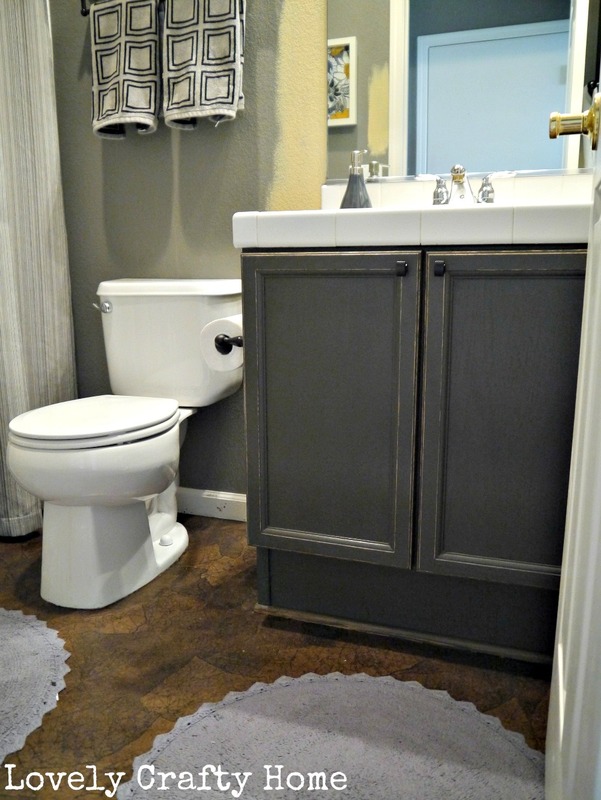 I am going to try that with blue-green-greyed stain in my kitchen? Another question, you didn’t stain this like on your other post, right? Hi I was just wondering if you have ever tried this on kitchen counters or in a walk in shower. I would live to do this in my kitchen and bathroom! How well does it wear? Has anyone repaired one of these floors? How do u get some pieces of the paper lighter looking and some darker looking in the finished product on the floor? 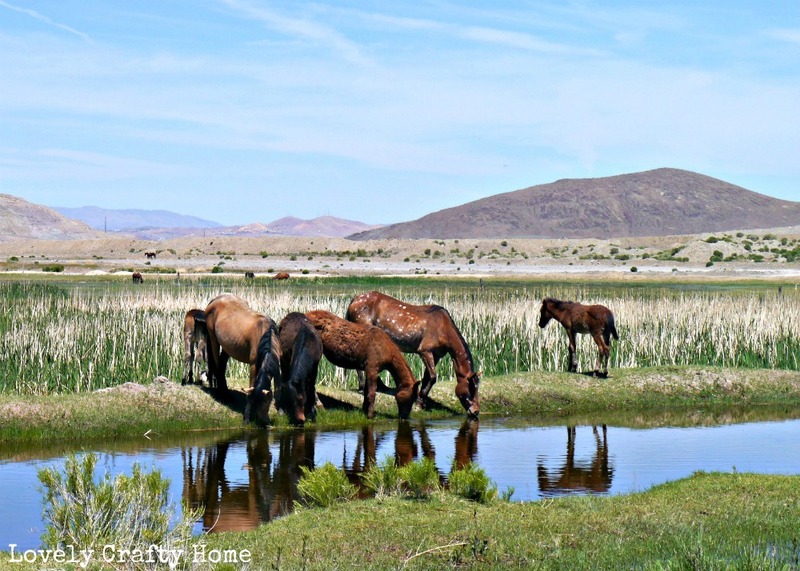 I have a vacation mobile home in the dessert. How do you think this would hold up in the heat. I truly love the over all look that you went for in your parents bathroom. 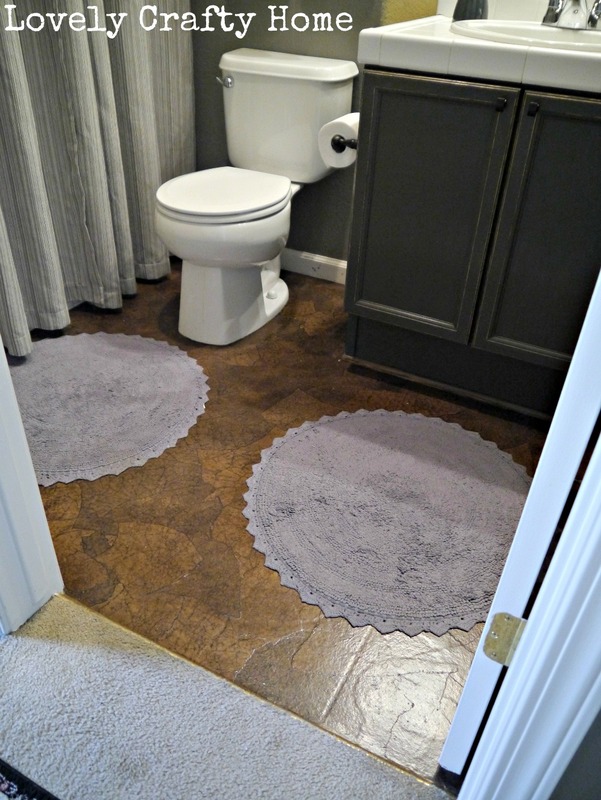 I am in the process of redoing some things in my guest bedroom and bathroom, except I’m doing a penny floor in the bath and paper floor in the bedroom. Well I am just wondering the exact yellow color it is your parents decided to go with on their bathroom wall? That is really a beautiful floor. It looks like stone. The lines from the linoleum wouldn’t bother me at all. I think I might give tis a shot. Thank you so much for sharing this. It’s a simple clean, prime, paint method. Sometimes if the vinyl’s “pattern” is OK, it looks even nicer after it’s painted. As in the case of your grid patterned floor. The grid stays visible but the color is changed.